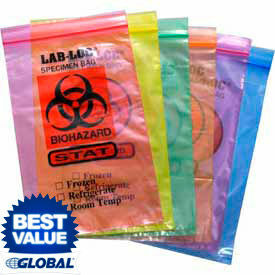 3-Wall Style Specimen Transfer Bag Allows Secure Specimen Storage and Transport For Hospitals, Laboratories, and more. The outer pouch secures the accompanying paperwork preventing moisture entry and damage. The polyethylene construction provides content security and spill prevention for user safety. The bags are available with or without printed messages. Multiple color options are available. Dimensions vary per model. 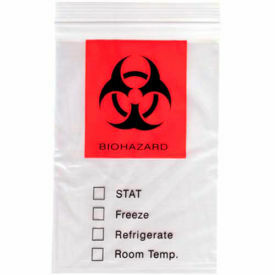 Biohazard Specimen Bags Safely Store and Transport Hazardous Materials and Chemotherapy Drugs For Medical and Laboratory Applications. The outer pouches are designed to secure paperwork preventing moisture entry and damage. The pre-printed symbols allow easy bag identification. Includes check boxes for efficient labeling and processing speed. The clear color finish allows high content visibility. Dimensions vary per model.